Suppressing field emission on a single-cell cavity after rinsing with chloroform. After rinsing, the cavity reached a record 44 MV/m field. R&D in this area seeks to improve the performance of niobium accelerating cavities. They are qualified by two figures of merit: the accelerating field, Eacc, and the quality factor, Q0, which is inversely proportional to the surface resistance. Shorter structures can be obtained by increasing Eacc, and cryogenic cooling requirements can be reduced by increasing Q0. So far, accelerating fields in the region of 40 MV/m have been obtained with a quality factor of about 1010, but only with bulk niobium, electropolished, baked cavities. Additional facilities for studying surfaces and superconductivity are now available in completion to ongoing experiments to optimize electropolishing and baking processes. 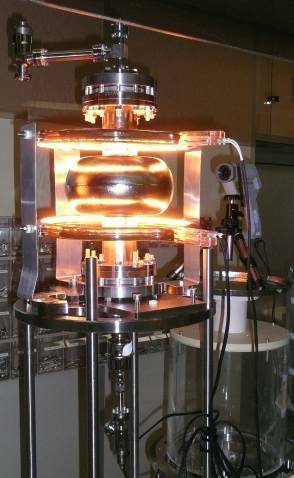 Recently a new development work has just begun on a new family of superconductors that are specially tailored for superconducting radiofrequency (SRF) applications, and that should outperform bulk niobium. Comsol-generated model of hydrodynamics and acid concentration during horizontal electropolishing of a 9-cell cavity. The process could be made more homogeneous. The experimental R&D on electropolishing started under the CARE-SRF program has continued. Impedance spectroscopy studies on revolving samples have provided greater insight into the electrochemical aspects of the system. Models made using Comsol software and applied to multi-cell devices have also shown that the process could be improved through enhanced fluid homogenization. Work on a single-cell cavity showed that low-potential treatment was just as effective as the standard process and induced less electrolyte contamination. 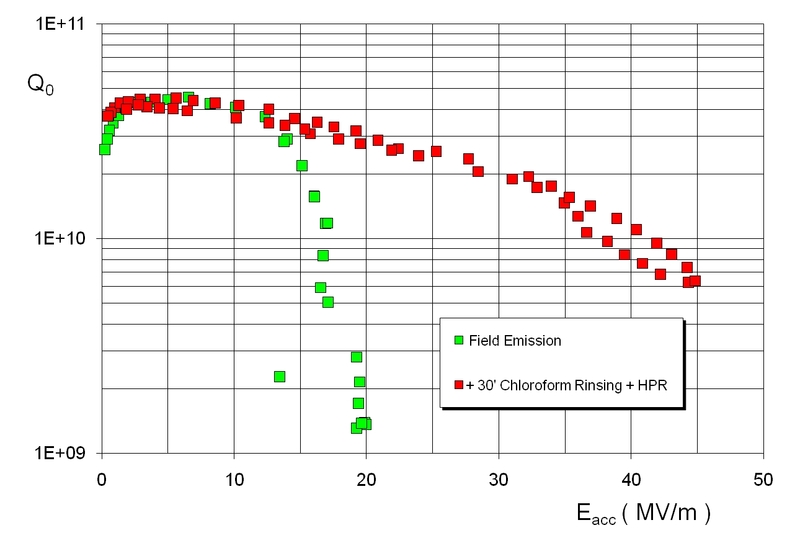 Rinsing a contaminated cavity with chloroform proved effective and resulted in a record 44 MV/m field. Tests were also performed on new electrolytes offering improved performance in terms of lifetime and roughness. All these experiments involved foreign partner laboratories: DESY, KEK, and J-Lab. A vertical EP line for large, multi-cell cavities (ILC, SPL) will soon be installed at Supratech. Baking a single-cell cavity in the clean room. A “fast” baking process for cavities has been developed. The new process is an improvement on “standard” baking, in which cavities are placed in a vacuum at a temperature of 120°C for 48 hours. Baking modifies the superconducting surface, a phenomenon that has often been attributed to the diffusion of interstitial oxygen at the metal-oxide interface. A PhD research conducted in collaboration with the Max Planck Institute in Stuttgart has definitively ruled out this hypothesis. Low-angle X-ray methods (synchrotron radiation) allowed extremely precise observation of transformations in the oxide layer and of oxygen diffusion. Not only does the quantity of oxygen not drop during baking, but for some crystallographic orientations it actually increases, although energy dissipation decreases in baked cavities. 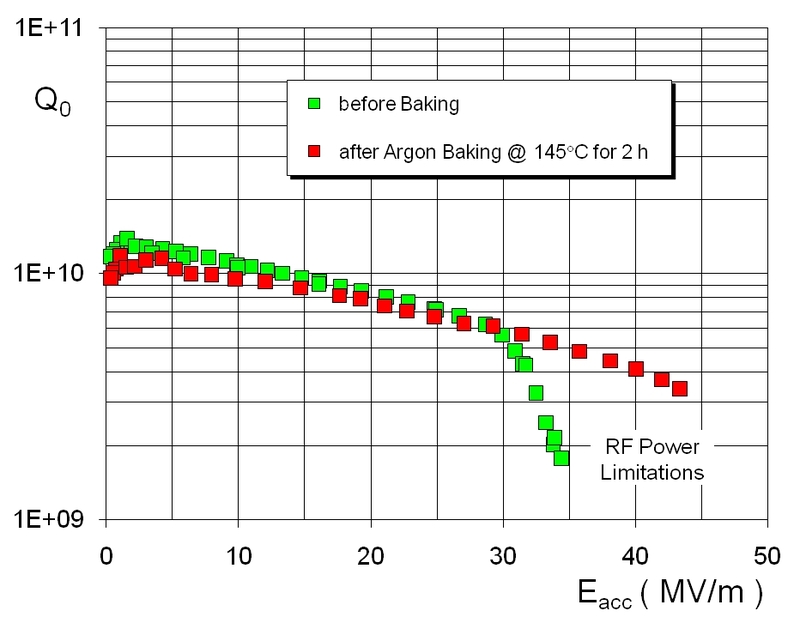 Positron annihilation experiments, carried out in collaboration with the CNRS in Orleans, have shown that baking leads to a very significant increase in the number of vacancies in the first 100 nm of the surface (which is where the magnetic field causes dissipation). This observation points out to alternative explanations for the baking effect. Radiofrequency tests on a single-cell cavity, following “fast” baking under an argon atmosphere at 145°C for two hours. 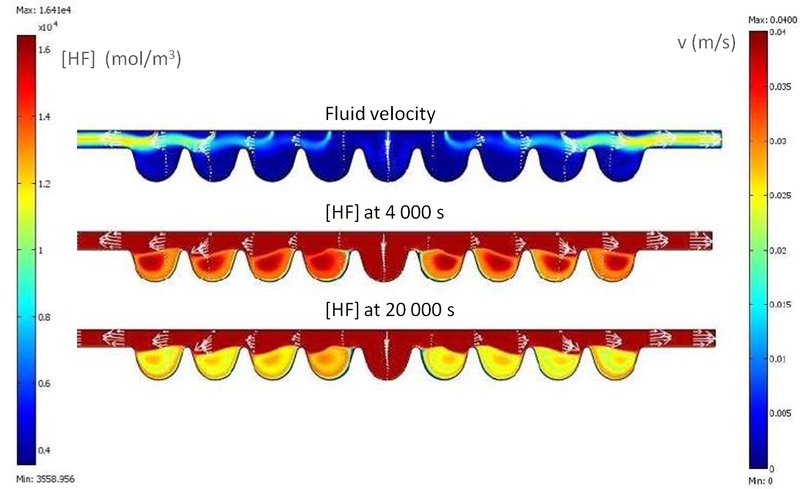 A number of experimental findings, combined with the latest theoretical progress in the field of SRF, would seem to suggest that the dissipation phenomena observed at high fields could be due to isolated vortices penetrating the superconducting material. This would explain why niobium has had the monopoly so far: it is the superconductor with the highest first critical field (penetration field for the first vortices). In 2006, theoretician A. Gurevich proposed “shielding” niobium with nanometric superconducting layers with a far higher transition field than the bulk material. Longitudinal first penetration field of the reference sample shown in green, compared with that of the same sample covered with a 15 nm MgO layer and 25 nm NbN layer, shown in blue. First vortex penetration is significantly delayed by the NbN layer. It is hoped that by using a material with a higher critical temperature than niobium, it will be possible to increase the field in the cavities, with out vortex penetration in the material, and also to reduce heat dissipation. A series of model samples was deposited and characterized, in collaboration with the CEA/DSM/INAC Grenoble. 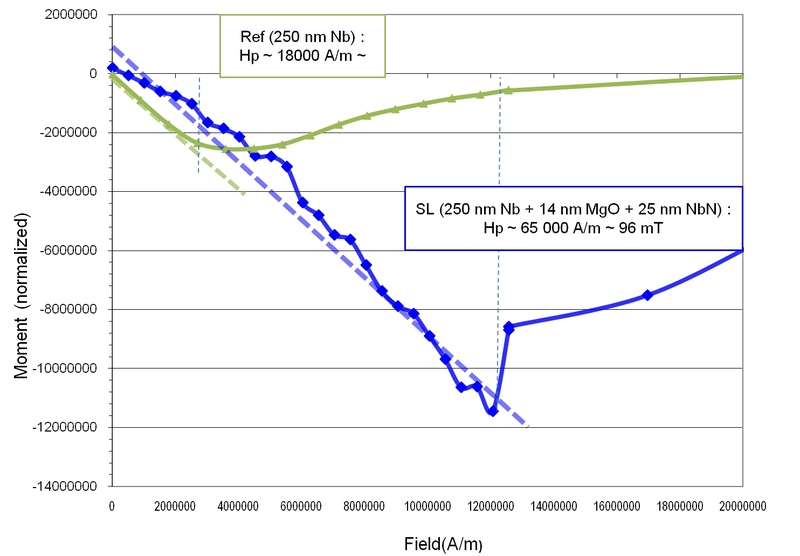 A sample consisting of 15 nm of magnesium oxide, then 25 nm of niobium nitride, deposited on a 250 nm layer of niobium, exhibited a first critical field that was significantly higher than a sample with niobium alone.